Belgium may be a small country but it occupies an important place in the global arms trade. According to SIPRI, from 1998 to 2007, Belgium was twentieth in the list of top arms exporters. A handful of Belgian companies, like FN Herstal in Wallonia and Barco in Flanders, are currently world leaders in the market for certain types of arms and related technologies. In parallel, however, Belgium has on several occasions in the past been a decisive pioneer in improving arms control and monitoring mechanisms. Belgium was the first country to recognise the binding nature of the EU code of conduct on arms exports by incorporating it into domestic legislation in 2003. Belgium also played a leading role in the adoption of the 1995 Ottawa treaty banning landmines, and more recently in the adoption of the 2008 Oslo treaty banning cluster bombs. GRIP continually monitors Belgium’s policy on the manufacture, trade and ownership of arms, with particular involvement and paying particular attention to changes in Belgian legislation in these fields. Belgium's Foreign Minister Karel De Gucht addresses the Small Arms Review Conference. 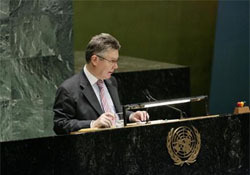 The Conference discusses the elimination of illegal small arms in order to save more lives, and will run from 26 June until 7 July 2006 at UN Headquarters in New York. 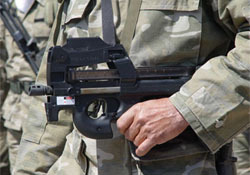 Pistolet mitrailleur semi-automatique FN P90 produit par FN HERSTAL, aux mains d'un Garde national chypriote. Photo prise durant un défilé à Larnaca. Reports from the Belgian federal government and the governments of the regions to their parliaments on application of the 5 August 1991 Law, amended by the 25 and 26 March 2003 Laws, on the import, export, transit and fight against the trafficking of weapons, munitions, material designed solely for military use or for maintaining order, and related technology.